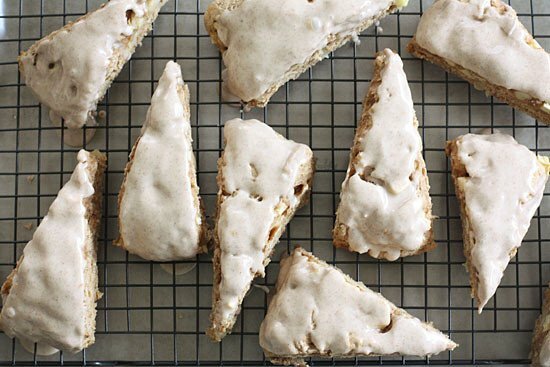 Apple Scones with Spiced Glaze are made with buttermilk, diced apples, cinnamon and spices – perfect for lazy weekends! 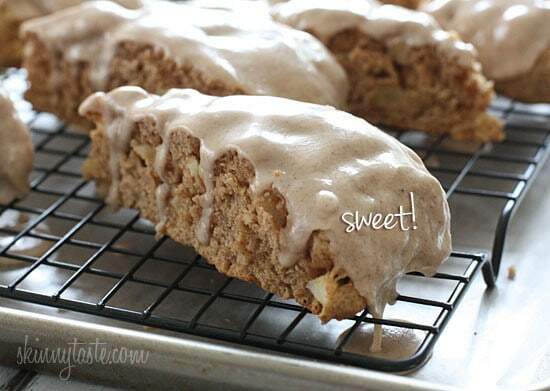 Chocolate chip scones are usually my favorite scone variety, but these apple scones may have taken their place! The scones aren’t too sweet, so the glaze gives it the perfect balance of sweetness in every bite. If you want to cut back on your sugar, you can make half the glaze, then drizzle it on instead. When the weather gets cool, turn your oven on and warm up the house with the sweet smell of apples and cinnamon. The temperature dropped like 20 degrees since last week, and these homemade buttermilk scones with small bits of apples and a cinnamon spice glaze were the perfect excuse to bake. Perfect for an afternoon tea or a lazy Sunday brunch. Enjoy! 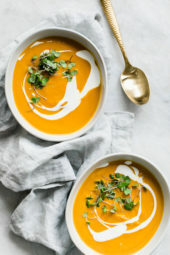 Combine the first five ingredients in a medium bowl, stirring with a whisk. 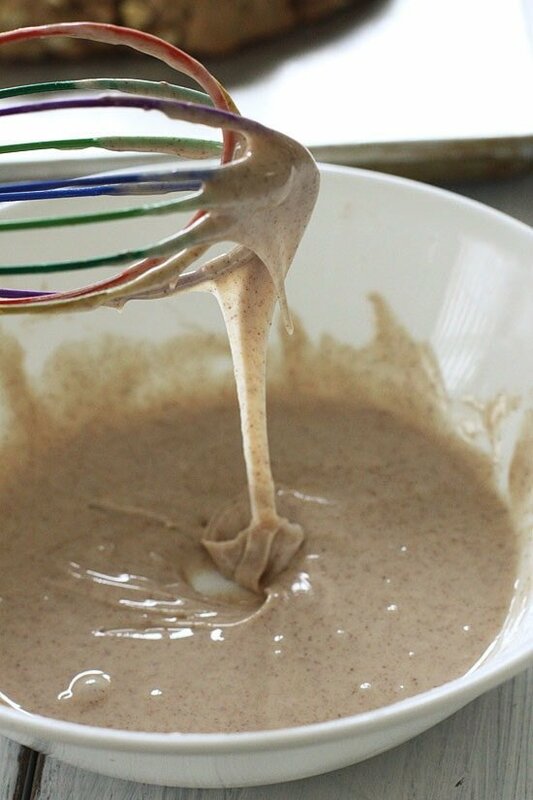 Combine the flours, baking powder, cinnamon nutmeg, and salt in another large bowl, stirring with a whisk. Cut in chilled butter with a pastry blender, or you could use 2 knives, until the mixture resembles coarse meal. Fold in diced minced apples. Add buttermilk mixture, stirring just until moist. 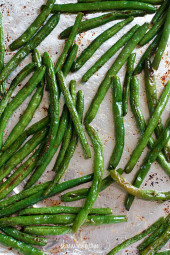 Form dough into an 9-inch circle onto baking sheet, about 3/4″ thick. Using a knife, cut dough into 12 wedges all the way through. 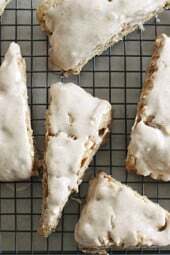 Place scones on parchment or wax paper and drizzle the glaze over the scones using a spoon – or- place the glaze in a shallow bowl and dip the top of the scones into the glaze, then let it sit on the waxed paper to harden. Makes 12 scones. Do you think I could sub yogurt( maybe thinned with coconut milk) for the buttermilk? My lactose intolerance can tolerate yogurt but not milk. Love every single recipe I have tried of yours so far!!! Thank you! I have not tried, but you can test and see. These were SO good! I have celiac so I made them with 1 cup oat flour and 1 cup gf AP flour. I used whipping cream and cider vinegar for the buttermilk. I baked them 25 minutes and cooked them for a good hour before glazing. The glaze is delicious and a must. I drizzled it on, very pretty. They kept well the next day. Can’t wait to make these again! Has anyone use Almond flour to make these? I made this recipe yesterday and it was delicious! Any tips on storing them? I put mine in a Tupperware and this morning they are soggy as they have absorbed all of the glaze. I was hoping they would have hardened a bit and that the glaze would still be a thick layer on top! What is the best way to store these? If I make these a day in advance, is it better to add the glaze the next day? Unfortunately, I did not find the scones to have enough flavor. I am, however, going to try the Lemon Cranberry Scone recipe and hope for more success! The dough was very sticky and very hard to work with. Should I have used more flour when needing it? I only lightly floured my working surface. They definitely did not turn out like Gina’s pictures. Not sure about the taste and texture. The nutmeg was a little overpowering. Hi! Made these following the recipe exactly (with the exception of using only all purpose flour as that was what I had on hand) and the dough came out really runny and sticky. It was impossible to knead into a ball because it just kept sticking more to my hands than itself (even with floured hands). Was not using wheat four the cause? Was it something else? These scones are tender and delicious! I didn’t use the nutmeg because I’m not a fan but other wise I followed the recipe as written. I will be making these often! Thanks Gina! My husband is gluten free. Could I make these with gluten free flour ? What would the substitution amounts be ? I use all in one gluten free flour. Thanks in advance ! I have made gluten free scones using King Arthur baking mix and they came out great. Running the nutrition info through the Freestyle calculator yielded a Freestyle point count of 8, not 7. Has anyone made this substituting the brown sugar with Swerve and if so was it 1:1 ratio? Also, what about substituting buttermilk with FAGE fat free yogurt? My husband has a milk allergy but not all dairy. We usually use coconut or rice milk and soy free butter. Is there a substitute for buttermilk? Awesome recipe. They are so yummy 🙂 I used a powdered buttermilk mix and was worried it wouldn’t work but they turned out amazing. I chose to do half glaze and drizzle. So lovely. Would these turn out as well if in only used all purpose flour? I don’t have whole wheat flour and I don’t want to buy a whole container for just one recipe. I am going to try it…will let you know. This was my question too. I used all purpose flour for both cups and they turned out well. Delicious. 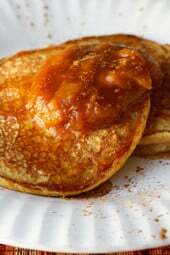 I used frozen homemade apple sauce sweetened with stevia and substituted 3 packets of stevia for the brown sugar. Made these scones for my family who were visiting from out of town. They were SPECTACULAR! Thank you for making a low calorie scone recipe that tastes delicious. These will be a staple in our home for years to come.